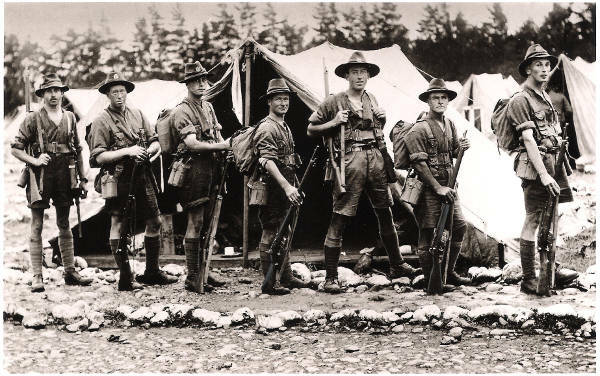 Group of soldiers at Featherston Camp, 1917. Donald Hosie third from right. The Sarjeant Gallery’s foundation stone names Edmund Anscombe as the architect, but the real architect was a young man called Donald Hosie. How did the credit for this beautiful building end up assigned to the wrong man? In 1912 Henry Sarjeant had left an enormous sum of money to the Borough of Wanganui – the equivalent of many millions of dollars today – to build an art gallery ‘for the inspiration of ourselves and those who come after us’. The council decided to hold an architectural competition to find a suitable design. The competition was advertised across New Zealand and in Australia in October 1915, with a closing date of 11 January 1916. Samuel Hurst Seager, a Christchurch architect with expertise in matters of Gallery design, was appointed to assess the entries. Thirty-three designs were submitted, and in May 1916 four were short-listed for the final stage. At this point they were anonymous – the names of the competitors known only to the Town Clerk, George Murch. The clear winner was number 16, revealed to be from the office of Edmund Anscombe in Dunedin. But there were rumours that the work was not Anscombe’s at all, but rather of an articled pupil in his office: Donald Hosie. The competition rules were explicit – the author of the winning design was to be appointed as architect for the construction of the Gallery. Hurst Seager wanted to be sure before announcing the result. On 18 October, Anscombe signed a declaration that “the design of the plans for the proposed Wanganui Art Gallery was my own personal work and the drawings were prepared under my own personal supervision and according to my instructions.” On 24 October, Hurst Seager travelled down to Dunedin to conduct an enquiry with the assistance of four Dunedin architects who had not taken part in the competition. On his way to the meeting, he took a look at the Harvester Co.’s building (still there today, opposite the railway station) which was designed by Hosie and noted “Detail very similar to Art Gallery. A fine work”. On 7 November 1916, Hurst Seager signed a declaration that the author of the winning design was Donald Peter Brown Hosie and recommending he be appointed architect. But it wasn’t over yet. During November and December Wanganui Council sought legal advice as to whether the design belonged to Anscombe as Hosie’s employer, and was informed that it was indeed the case, so the plans could not be used without Anscombe’s permission. Hurst Seager sought another legal opinion that directly contradicted this, but to no avail. Council decided to appoint Anscombe, seemingly on the grounds that the copyright in the design belonged to him, not Council. By this time Hosie had joined the army and was scheduled to be sent overseas. The best Mayor Mackay could do was arrange for him to have leave to complete the detailed drawings of the Sarjeant Gallery. Shortly afterwards he went overseas with the 23rd Reinforcements. 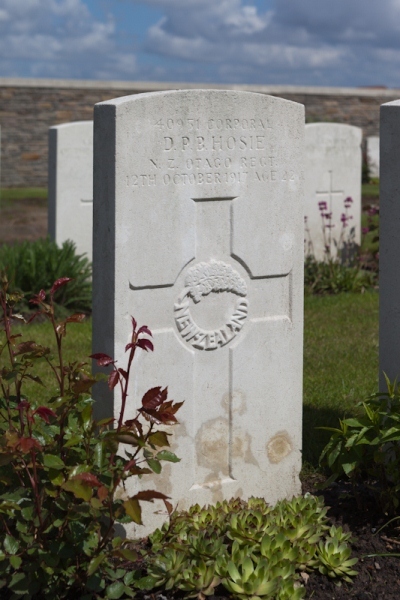 On 12 October 1917, just three weeks after the foundation stone of the Sarjeant Gallery was laid, the twenty-two year old Donald Hosie was killed in action at Passchendaele.